After a well deserved and very inspirational holiday followed by a week long cold I´ve had plenty of time to think about what to do with the blog. I love blogging, but don´t seem to be able to find the time. And so I´ve decided to put my effort in to Facebook instead. I might return here once and in a while, when I have some background material to share. Mainly on Scandinavian pottery. But it´ll be more like an archive of information. "What do you think about mixing old and new with a bit of kitsch? Small vase with deer from Swedish Anna Carin Dahl (http://annacarindahl.com/), the candle holder is made by Soholm in the 1960´s ( http://etsy.me/1aimyiU), the plastic deer is my own private and very loved kitsch" Update from the shop´s Facebook page. The little black house on Facebook is a shop page, but I do my very best not to make it the ordinary marketing page bombarding you with things you should buy or share to get a good discount. My aim is to inspire and hand over a bit of information when convenient. In this post you can see a couple of the latest updates from Facebook. Want to join? You find the page HERE. "With autumn the season for inviting friends over for dinner has arrived. Here´s a simple table decoration made of branches with autumn leaves and small bouquets of rowanberries. 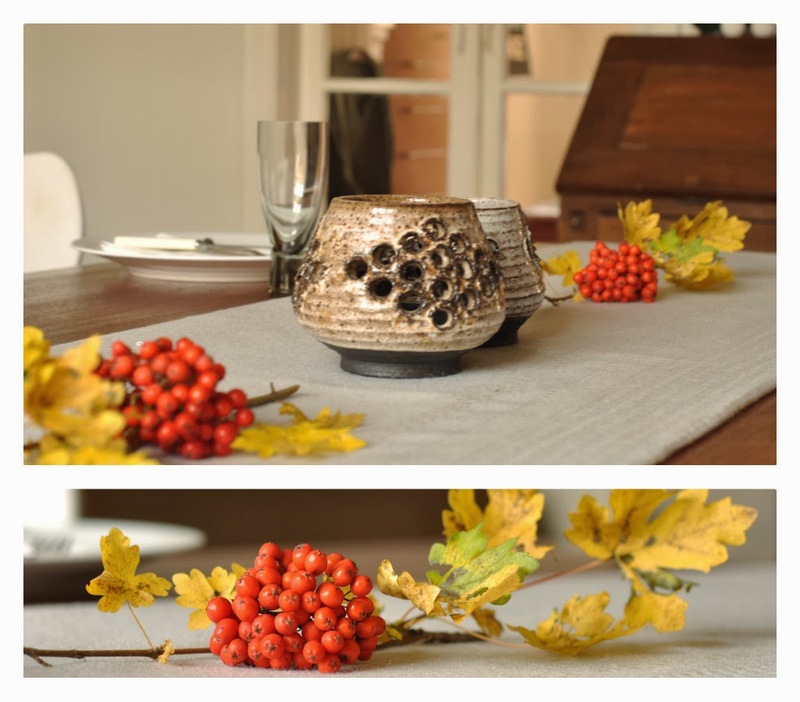 Together with candle holders and tablecloth from the shop it sets the scene for a lovely evening." Update from the shop´s Facebook page. See you. I´ll keep on reading all the lovely retro blogs out there. And maybe we´ll meet again on Facebook. Det gleder jeg meg til, Birgitte!! Vi ses!! I´m sorry to disappoint you, Vicky. I`m working on a new concept for the blog, but it will take some time before I´m ready. I'll check back ever so often. I love your photos and wish I could buy everything in your shop!